The 10K begins at 8:00 a.m. sharp! Please plan to arrive at the start to line up with sufficient time. 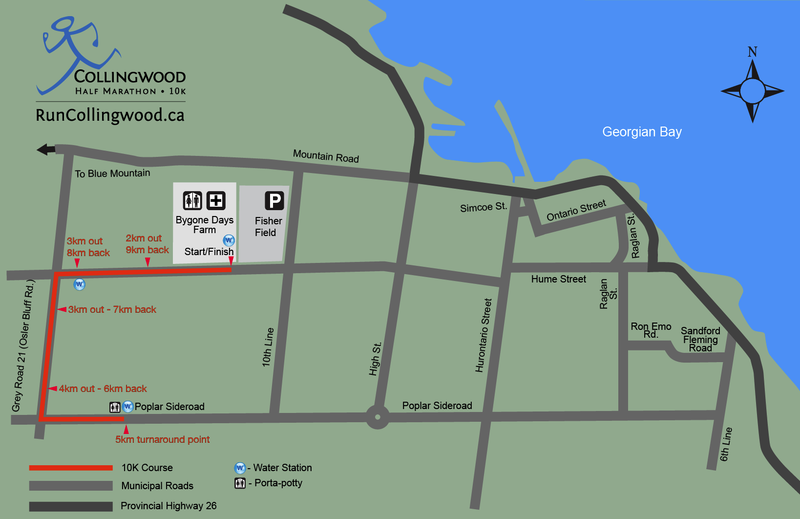 The Run Collingwood 10K event is designed to appeal to runners who are more comfortable with a run that is less than a half marathon, but want more than a 5K. It’s an ideal race to run as a family event! The out and back course takes you out Sixth street towards the ski hills of the Niagara escarpment and back to Fisher Field. The course is also accredited with Athletics Ontario: Accreditation class AAA – 201710015. There will be Aid Stations along the route, supplying runners with Water and Gatorade. The course will be marked every kilometre. All events will be timed using the BibTag timing system. Pickup Dates/Time: Friday October 4th, 10 a.m. to 8 p.m. Kits will not be mailed. Anyone can pick up your kit. They may be asked for identification and your confirmation number (if you registered online). Important! If you cannot pick up your bib and shirt during the times above, you can pick them up the morning of the race prior to 7:30 a.m. Fisher Field (south parking lot). The registration table will be located at the south parking entrance. Online Registration closes Wednesday October 2nd at 11:59 p.m. You can still register on Friday October 5th by filling out the offline entry form (click here) and bringing it to race kit pickup. There will be NO race day registration. 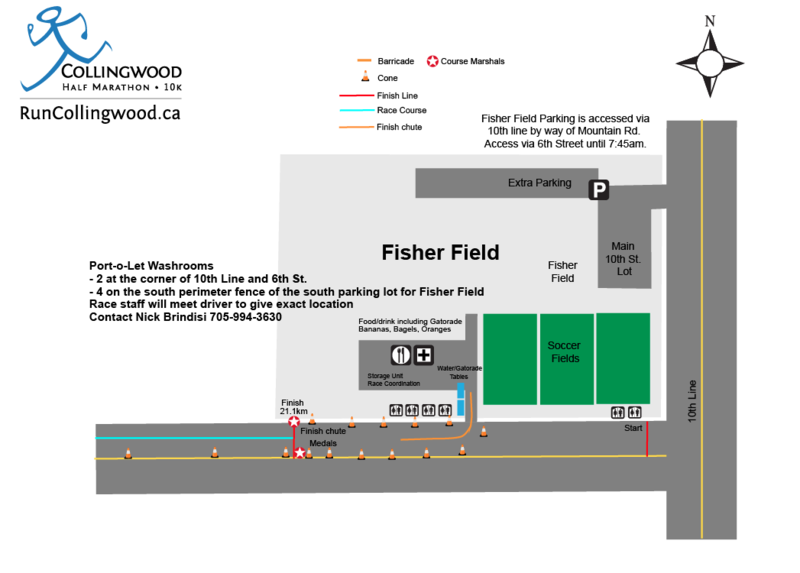 Please note that all parking is accessed via Fisher Field from Tenth Line. The finish chute is located between Bygone Days Heritage Village right next door and the entrance shown above to Fisher Field. Food, massage, medical and family meet and greet are at Fisher Field. Please follow the signs. Course marshals will be available to direct you.